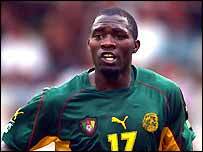 Cameroon midfielder Marc-Vivien Foe has died after collapsing during an international match in France. The 28-year-old fell to the ground unchallenged in the 72nd minute of a Confederations Cup semi-final against Colombia in Lyon. He was treated on the pitch before being stretchered off and receiving further treatment, including mouth-to-mouth resuscitation and extra oxygen. Foe spent last season on loan at English club Manchester City from French club Olympique Lyon and also played for RC Lens. Medical staff are believed to have tried to restart his heart for 45 minutes but without success. "The player was still alive when he was taken to the medical centre in Gerland Stadium in Lyon, where he died," said Alfred Mueller, Fifa's Swiss medical officer for Lyon. "It is too early to determine the exact causes of his death." An autopsy will be carried out to determine the cause of his death. After paying a tearful tribute to Foe, France beat Turkey 3-2 in the other Confederation Cup semi-final. Fifa president Sepp Blatter said: "Fifa and the whole family of football are shattered by this unbelievable tragedy. "On their behalf, I wish to convey our sincerest condolences to his family and loved ones, to Cameroon football and his club, and express all our support at this painful time. "Football has lost a remarkable player and a remarkable man." Blatter also said that the Confederations Cup final between France and Cameroon will definitely go ahead on Sunday. France captain Marcel Desailly had questioned whether or not the game should take place. "I would totally understand if the Cameroon team refused to take part in the final," he said. "Manchester City are to retire Foe's number 23 shirt as a mark of respect"
"Marc Foe was a very special man"